The game of football demands that you play in a physical manner. Often, I see some of the bigger sized football players who are not very physical or aggressive and it always disappoints me when I see that. Well, the guy I met with today is one of the most physical and violent players I have seen in Eastern Washington this past season. I am going to make a bold statement, but oh well! 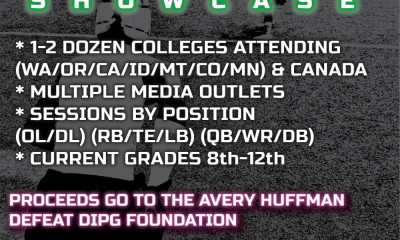 College coaches you can thank me later for helping you find a guy who is WAY, WAY off your radar right now but you will want him on your recruiting board FOR SURE! You’re welcome! Davion Pruitt is a 6’ 3” 295lb. class of 2019 OL/DL from Pasco High School in Pasco, WA. Davion is a three-sport stud athlete as he also is a great Wrestler and excels in the throwing events on the Track and Field team. Davion also is doing a great job in the classroom as he holds a 3.2 GPA. When I began working with NWPR I wanted to help expose players who may not get the attention as others for varieties of reasons. This kid is the textbook example of who I want to help. A month ago, I had never heard of Davion Pruitt and I most likely would not have heard about him until 15 months from now when the Mid-Columbia Conference releases there 2017 All-Conference List in November. 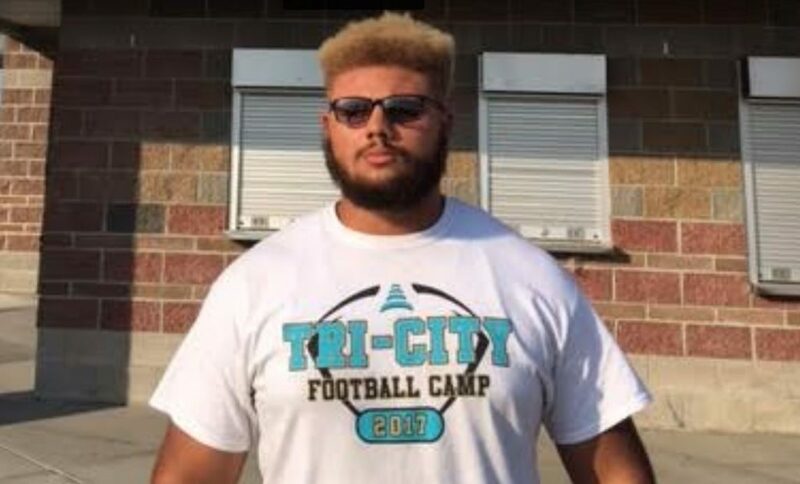 Thankfully I was given a 15-month head start on Davion Pruitt by a friend of mine and a fellow coach named Jerry Mercado who has coached Davion with Tri-City Elite football club. Jerry has a good relationship with Davion and upon his recommendation, I saw Davion’s film and I was immediately impressed with him. 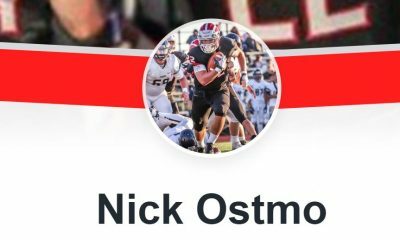 You college coaches I firmly believe will be just as thankful as I was that you have now been given a 15-month head start to put this guy on your recruiting board and initiate your contact however you do for a kid at this stage of his high school career. When I first saw Davion’s sophomore season highlight film (see attached film link at bottom of article), I spent most of the time with my mouth to the floor as I watched him dominate his opponents over and over. On the offensive side of the ball as an O-Lineman, I see a pancake fest in his run blocking. He is so physical, he gets his hands into his man, he keeps his feet very active and with sheer aggression, nastiness, and strength, he just smears the defender into the ground. On the defensive side of the ball, I think Davion could turn into a GREAT defensive lineman as he demonstrates on film a great ability to get his hands into the O-lineman and then get off blocks and stuff the middle of the line of scrimmage. He also does a great job on perimeter run plays of hustling down the line of scrimmage and making tackles with great effort. Davion is a no-nonsense kind of guy, who is dedicated to his craft. Davion has laser-like focus and is set on improving each day. Davion said to me during our meeting, “I stay after practice each day to get extra work on my run blocking and my pass protection and I am the first guy to show up to the weight room to work out and the last guy to leave the weight room after workouts are finished.” Davion’s commitment and dedication absolutely show up on his film and is also very evident off the field as well as he has max lifts of 365 lbs. in the bench press, 515 lbs. in the squat and 545 lbs. in the deadlift. Those are GREAT weight room numbers from a guy who still has TWO YEARS left in high school. Editors Note: Thanks to Coach Demian Walter for bringing this young star to my attention. Coaches this is one of the fastest most explosive athletes I have seen in a longtime. Many big men can move but few like this. The young man is on his way! Watch This. Davion has very impressive family bloodlines. His uncle is Lazarus Sims, who was a starting point guard on the 1996 Syracuse University basketball team that made it to the Final 4 and advanced all the way to the National Title Game versus Kentucky in his senior season. I personally remember his uncle very well as I was a big fan of that Syracuse team who was kind of a Cinderella team with John Wallace as their centerpiece as they took on mighty Rick Pitino and Ron Mercer, Antoine Walker and Tony Delk of Kentucky. He has a cousin who is Anthony Davis, the legend from Pasco HS in the mid to late 1980’s who played for the University of Utah and was a 9-year NFL veteran at linebacker (most of his career was with the Kansas City Chiefs). Pretty impressive family members. On the recruiting side of things, Davion as I mentioned earlier, has completed his sophomore season and is just now entering his junior year in high school so college coaches cannot call him yet but there has been some good initial contact from some colleges. Davion said the University of Utah stopped by his school and talked with him and Northwest Missouri State University (2016 NCAA Division 2 National Champions) has made initial contact with him. That’s a great start so far. There have been some great athletes who have come from Pasco High School over the years. There have been NFL players and legions of Division 1 football players who have worn the Purple and White. Speaking for myself, Pasco High School football is held in such high regard in my book. In the 1970’s, 1980’s, 1990’s and early 2000’s, Pasco High School, simply put, had some of the most gifted athletes and skill players you would find in Eastern Washington, mixed with some of the flat out toughest football players you would ever run into as well. I played in the “Old” Big Nine Conference in the early 1990’s and I think people forget just how legendary Pasco was from 1970’s till 2000’s. It was not a fun place to play on Pasco’s home court or home field in basketball or football. You rarely won at their place and on the rare occasion, you might beat them at their place you were not getting out of the parking lot nor the city limits without fighting your way out. But that is one of the things I always thought made Pasco sports so intriguing. They loved their team and there was a nastiness to their teams and their players that made them GREAT. I look forward to the days when Pasco High School rises back up to that level again and I will be the first to be a PHS fan and supporter. I think Davion Pruitt is the next GREAT football player who is going to come out of Pasco High School. This is one of the toughest kids I have seen on film this past year. Meeting Davion in person only solidified his toughness in my opinion. He is built like a grizzly bear and he plays as violent as a grizzly bear as well. 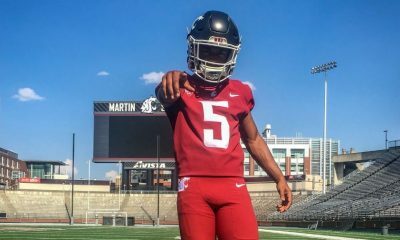 Considering Davion was only a sophomore last season and you see some of the wreckage he caused on film as an underclassman it is horrifying to think of the physical pain and suffering he may cause to some opposing players this season as he is more refined and bigger and stronger now that he is a junior. 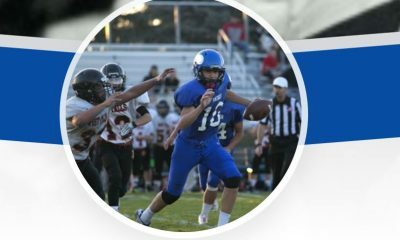 This guy has two more years in high school and I can’t wait to see the destruction he leaves in his wake as he terrorizes the Mid-Columbia Conference just like so many former Pasco HS players used to do in the days of yore. I think this coming December and January and especially next spring of 2018, there will be many Division 1 College Football Coaches lining up in the hallways of Pasco High School to meet Davion Pruitt just like during the heyday of Pasco Football. I can’t wait to see the player that this kid develops into and I wish him all the best of luck as he is developing as a football player and a young man.